Polyacrylamide Market size was more than USD 5.5 billion in 2016 and will witness 8.5% growth over the projected timespan. 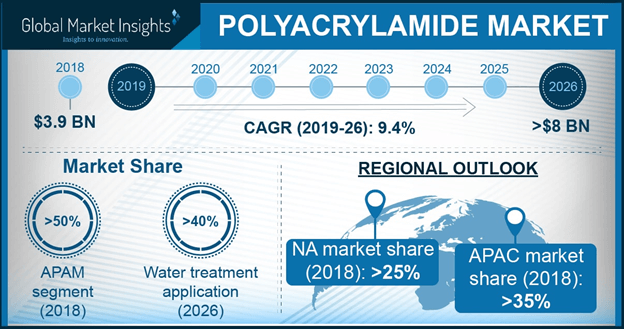 Strong product demand in industrial sector primarily in the water treatment facilities will majorly influence polyacrylamide market size over the projected time spell. This is credited to consistently improving environmental regulations imposed by government and regional regulatory bodies to reduce harmful agents in the environment capable of spreading fatal diseases, to ultimately attain sustainable business growth in the coming years. Product has been extensively used as an effective flocculant and coagulant owing to its versatile properties including high thermal stability, water solubility, high miscibility, non-toxic nature, etc. for separating suspended solid particles present in the waste water. In addition, overall flocculants market was more than USD 5 billion in 2013 and is likely to mark USD 8.5 billion over the forecast timeframe. Rapidly depleting natural resources along with stringent regulatory framework which has been compelling industries to treat water before letting out to prevent harmful implications on human life and environment will propel product demand at an unprecedented pace in the coming years. Rising product demand in the petroleum industry to recover oil from reservoirs will help attain prominent gains in the market size over the projected timespan. This is primarily due to its excellent properties including high viscosity and ability to form gel with crosslinkers which makes it desirable for enhanced oil recovery treatment in the petroleum industry. Rapid exploration and production (E&P) activities in the U.S. which is attributed to shale oil boom will propel the polyacrylamide market size by 2024. For instance, U.S. has 622.5 trillion cubic feet (tcf) of technically recoverable shale gas reserves and 78.2 billion barrels of tight oil reserves which is likely to be produced in the coming years. Volatility in the raw material prices such as acrylonitrile which is attained from crude oil along with development of bio-based products in the industry will hamper the industry size over the projected timeframe. In addition, as per WHO, acrylamide is carcinogenic in nature which is probable to hinder the market by 2024. 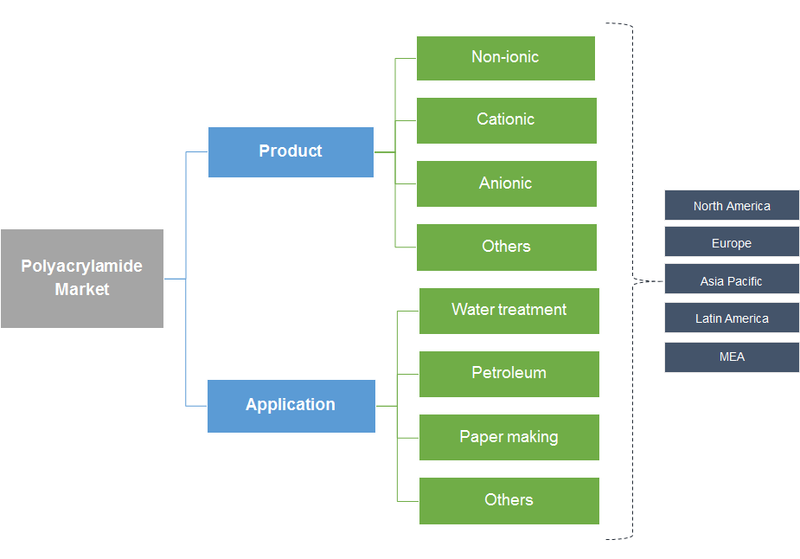 Anionic polyacrylamide market size attained the highest share and is likely to grow at a CAGR close to 7% owing to widespread product application in water treatment, oil recovery, paper making additives, etc. It is desirable for industrial waste water treatment which is coarse, high concentration with positive charges and is alkaline in nature. It is highly effective in waste water treatment for iron and steel plant, electroplate factory, metallurgy and coal washing, etc. In addition, it finds application in the petroleum industry as drilling mud material and helps in raising the drilling rate and avoid well disruptions. Cationic polyacrylamide market size was valued over 1.8 billion in 2016 and is anticipated to grow at a healthy CAGR over the projected timeframe. This is attributed to widespread product application in industrial waste water treatment, enhanced oil recovery and sludge dewatering. It has high dehydration rate and is primarily used for waste water treatment in alcohol, sugar, beverage, tanneries, dyeing industry, etc. Additionally, it can also be used as a paper additive. Polyacrylamide market size for water treatment is expected to grow at a CAGR close to 8% in the coming years. Rapid industrialization and urbanization in Asia Pacific has propelled product demand due to rising levels of waste water and pressing need to conserve the depleting natural water resources. Furthermore, stringent environment regulations imposed by regional regulatory bodies and government to treat industrial waste water before releasing is another factor which will make prominent contribution towards the market during the forecast period. Polyacrylamide market size for petroleum is anticipated to grow at a CAGR close to 8.5% in the coming years. This is attributed to rising energy demand across various end-user industries including transportation, power, household, etc. which will result in rising exploration & production activities and will subsequently propel product demand owing to its application in enhanced oil recovery technology. Product is also used as paper making additive in the paper industry which in turn will drive the market by 2024. Asia Pacific polyacrylamide market is the fastest growing segment and is anticipated to grow at a CAGR of over 8% during the forecast period. Growing population along with rapid industrialization and urbanization in the region has given rise to water pollution which has harmful implications on human life and environment. Persistent need to treat industrial waste water primarily in India, China and Malaysia to conserve depleting natural resources will boost product demand in the coming years. North America market was valued over USD 1 billion in 2016. This is credited to the U.S. shale oil boom which has led to rising product demand to recover oil from reserves. Furthermore, strong awareness about water treatment facilities to attain sustainable business growth has been driving product demand over the past many years. This trend is likely to continue owing to stringent environment norms formulated by U.S. EPA to encourage waste water treatment coming from industrial and household sector. Polyacrylamide market share was consolidated in 2016 with key industry players accounting for more than 40% of the total market. Some of the prominent product manufacturers are BASF, PetroChina Company Limited, Kemira, Solenis, SNF Floerger Group, Anhui Jucheng Fine Chemicals Co. Ltd., Mitsubishi Rayon Co Ltd., Shadong Polymer Biochemicals Co. Ltd. and Xitao Polymer Co Ltd. The industry has several contributors but it is mainly led by Asia Pacific players in terms of production. Key industry players are investing heavily in the R&D and its production facilities to expand its geographical presence and attain competitive advantage in the business. For instance, Solenis, a leading specialty chemical producer invested USD 5 million in its manufacturing facility in Russia which is likely to double the polyacrylamide production capacity to meet the rising product demand in the near future. Furthermore, major players are also investing in backward integration plans to combat fluctuating raw material prices. Polyacrylamide is used as a waste water treating agent owing to its excellent properties including high thermal stability, water solubility, high miscibility, non-toxic nature, etc. In addition, it is also used in the petroleum industry during exploration and production to extract oil from reserves via enhanced oil recovery technology. It is also used as paper additive in the paper industry. Various polyacrylamides available in the market are cationic, anionic and non-ionic. Rising need to conserve the depleting natural water resources has led to prevailing water treatment facilities primarily in the Asia Pacific. This is attributed to growing population in the region, which has given rise to industrial and sewage wastewater and therefore rising hazardous implications to human life and environment. Moreover, rising energy demand across various end-user industries including transportation, household, power, etc. will drive E&P activities and will boost product demand in the coming years.